Please Call 1 (800) 738-7209 for availability. Vetmedin is used to manage certain types of congestive heart failure. It differs from other commonly used heart drugs because it helps the heart pump more efficiently. How it works: Vetmedin opens up the blood vessels that take blood away from the heart, effectively reducing work the heart does to pump blood. At the same time, Vetmedin opens up the blood vessels returning blood to the heart, reducing pressure on the heart. Dosage & Administration: Give this medication exactly as directed by your veterinarian. If you do not understand these directions ask the pharmacist or veterinarian to explain them to you. Unless otherwise directed by your veterinarian, the total daily dose should be divided into 2 portions to be given 12 hours apart. The portion to be given should be to the nearest 1/2 tablet increment. Store Vetedin at room temperature away from moisture and light. 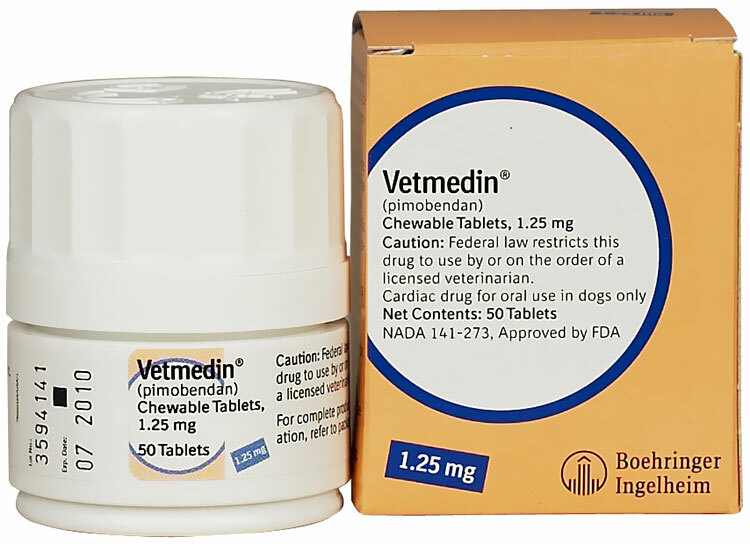 Vetmedin is a prescription medication used in dogs to increase the ability of the heart to pump blood. Vetmedin is used for the management of mild, moderate, or severe congestive heart failure due to atrioventricular valvular insufficiency or dilated cardiomyopathy. Tip: Vetmedin is available as beef-flavored chewable tablets. Storage: Store Vetmedin at room temperature away from moisture and light. What happens if I miss giving a dose: Give the missed dose as soon as you remember. However, if it almost time for the next regularly scheduled dose, skip the missed dose and give the next one as directed. Do not give a double dose of the medication. What happens if I overdose the pet: Seek emergency veterinary medical treatment. Symptoms of Vetmedin overdose that may occur include; loss of appetite, drowsiness, diarrhea, labored breathing, weakness, incoordination, fainting, accumulation of fluid in the lungs or abdomen, and cough. What should I avoid while giving Vetmedin: Vetmedin is not for use in humans. Do not give this medication to animals allergic to it. Do not give to animals with hypertrophic cardiomyopathy, aortic stenosis, or any other condition where an increase in cardiac output is not recommended. Do not give this medication to dogs less than 6 months of age. Do not give this medication to pregnant or lactating animals. Possible side effects of Vetmedin: If any of the following serious side effects occur, stop giving Vetmedin and seek emergency veterinary medical attention; an allergic reaction (difficulty breathing; swelling of the lips, tongue or face; hives), scratching, sudden onset of diarrhea, vomiting, shock, seizures, pale gums, coma. Continue giving Vetmedin and contact your veterinarian if your pet develops; poor appetite, drowsiness, diarrhea, labored breathing, weakness, incoordination, fainting, accumulation of fluid in the lungs or abdomen, and cough. Other side effects may also occur. Talk to your veterinarian about any side effect that seems unusual or bothersome to the pet. What other medications will affect Vetmedin: Tell your veterinarian if your pet is also being given verapamil (Isoptin, Calan, Verelan), propranolol (Inderal), theophylline (Theo-Dur), and pentoxiphylline (Trental). Talk to your veterinarian or pharmacist before giving any prescription or over the counter medicines, including vitamins and minerals. What should I discuss with my veterinarian before giving Vetmedin to my pet: Tell your veterinarian if your pet has any congenital heart defects, diabetes, or other serious metabolic disease. Tell your veterinarian if your pet is pregnant or lactating. Cautions: If serious side effects or allergic reactions occur, stop giving Vetmedin and seek emergency veterinary medical attention. When it was first determined that my 6 1/2 year old Australian Cattle dog needed this medication, I of course purchased it immediately. The first order was not that bad (under $100), but on the second order the vet hospital was charging almost 3 times more!!! Being on a fixed income, I was anxious to find something lower. I really hadn't thought about purchasing any RX online. My vet's nurses suggested it and I am so glad she did. I have been purchasing it now for 4 years and could not be happier! The pharmacy staff is so friendly, knowledgeable and willing to help at all times. particularly when I didn't leave enough time to ship!!! Thank all of you. ProsHave seen a definite improvement in my dog. Seamless Rx transfer from my local veterinarian to your website, Will use again definitely, Thank you! Fast and smooth transaction. Received without any problems. Very good customer service. Merchant Response:Thank you for the kind words Kayoko. Wishing you and your pet the best. ProsFast and smooth transaction. Received without any problems. Very good customer service. Merchant Response:Hi Bluff, thank you for your feedback and it's great to hear the Vetmedin works so well for your dog! I just found out my mind year old mini Schneider has congestive heart failure so his Doctor put him on this with a couple other meds. I can really see a difference! This pill is chewable and my dog takes them with no problem. It was really expensive through the vet pharmacy so I googled online and found Entirely pets Pharmacy with great reviews for half the price! It wasn't hard at all to order online! I will continue to use them. Merchant Response:Hello Monica, thank you for your comment and we are happy to hear the Vetmedin is working well for your dog! condition. Your pricing is works well with my budget and you were fast and efficient. You also dealt directly with my vet. I didn't have to do anything. ProsPricing Product availability Handled everything. My pup needs this med for her heart. Entirely Pets had beat the price of all others at the time I ordered it and I received it in the mail in a timely manner. Thanks. So grateful for this medicine. This drug has really helped! Our peek-a-poo was born with a murder that has gotten very bad over her lifetime. Vetmedin has helped give her a long, quality life. She's turning 16 yrs old in less than a month! Thanks for getting this to me so quickly. Entirely Pets Pharmacy is very cooperative. Received my items in good condition. Merchant Response:Glad we could help Patty, let us know when you're ready to refill your pets meds and we will get them right out to you! Easy to give to dogs since it is a chewable tablet . I recently learned that my dog has a heart condition and was struggling to pay for the associated medications. The costs for online were dramatically less and now she's getting the medications she needs to be healthy. Thank you! 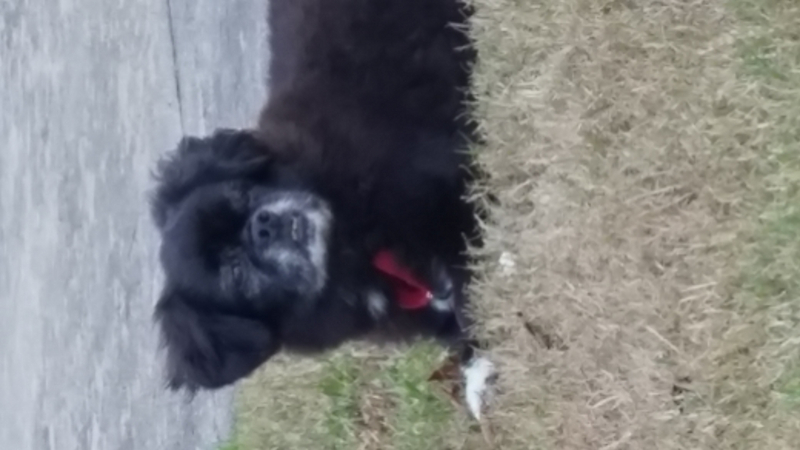 ~Lowest price that I could find on several medications for my dog ..
~Very helpful Phone customer service people.. I ordered this as prescribed by our vet. She seems much more comfortable with her heart condition and I could not believe the price difference at Entirely Pet Pharmacy. Vetmedin has made my 13 years old dog's quality of life much better. She is definitely more active and alert, than she has been for years. This drug is a Godsent. Thanks! ProsThis is a Miracle drug for my dog! Great pharmacy service and cost savings. Pharmacy personnel very helpful. Speedy delivery. My 10-year old King Charles Cavalier has been in heart failure for almost 2-years. I've been ordering from Entirely Pets (he takes 4 medications) for almost all that time and their prices are competitive and their products are always received in a timely fashion! Great service with timely delivery. I'm very happy with the purchase of Vetmedin. It was delivered quickly and was less expensive than the vet was charging. I like the fact that this item, the same item at a vet hospital, Entirely Pets Pharmacy is way much cheaper. It runs anywhere between $80 to over $100. Price at EPP $43.85. its bad enough your pet is sick then you take your baby to the vet and they charge ridiculous amounts for this and that. You want to help your pet and then they charge an outrageous amount for medicine. EPP also delivered on time. I am very happy with the service. EPP, keep up the good work. I am thankful that this is available at a decent price. If I only had the option of getting this from my vet I probably could not afford it.. I have seen improvement in my dog since he began this drug. Came as expected right on time. Will definitely use them again for future pet prescription needs. VETMEDIN ARRIVED WITHIN 7 DAYS AS STATED, AND THE PRICE IS A LOT LOWER THAN COMPETITIVE PHARMACY AND MORE LOWER THAN MY VET'S DISPENSE MED. THANK YOU, I SURELY WILL ORDER A REFILL AS IT COMES TIME TO RE-ORDER. ProsPRICE WISE IS VERY ECONOMICAL MORE SAVINGS FOR ME, I RECOMMEND ENTIRELYPET PHARMACY TO ALL DOG OWNERS. My precious George has a heart murmur and enlarged heart. He was diagnosed with Chronic Heart Failure, June 2014 and was put on Vetmedin to dilate his heart valves and make his heart pump more efficiently. It has helped him immensely. No side effects for him from the beginning but of course regular blood work is being done to monitor kidney, liver. etc.